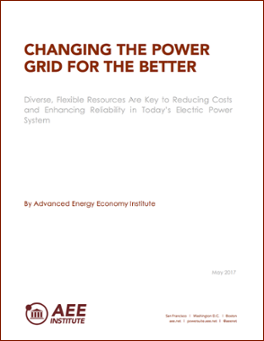 To inform to inform the 60-day Department of Energy study called for by Energy Secretary Rick Perry in an April 14 memo, this white paper by the AEE Institute shows that today’s electric generation mix is more diverse than ever; low-priced gas is primarily driving change in resources, followed by flat load growth and competition from renewables; and, as ERCOT and PJM demonstrate, reliable grid management is achievable with a high degree of variable renewables and even in extreme conditions. Also available is the cover letter to Secretary Perry from AEE, ACORE, AWEA, and SEIA accompanying the submission of material from all four industry organizations. Please fill out the form to download the white paper and cover letter. Webinar of press briefing held by AEE, ACORE, AWEA, and SEIA on analyses submitted to DOE to inform its study.